The design of the Firemove 140 has remained in the RRD range for some years now, being introduced way back in 2011, the brand’s 16th year. The widest in the group at 90cm, it has a subtle dome to its deck throughout and plenty of volume in its chunky tail. Its rocker-line is quite distinct, with easily the longest rocker-flat in the group, before kicking in the nose and curiously in the tail as well – unique for a board of this size. 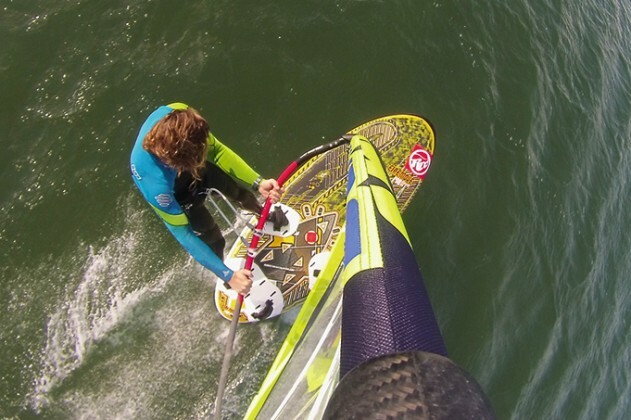 There is a wealth of footstrap options available, (all placed relatively inboard, particularly the front strap positions), and comes complete with RRD’s favoured Da Kine straps and an MFC fin. With such width, it is not surprising that the Firemove is incredibly balanced and easy underfoot. It is a big disc – short yet wide and capable of carrying weight effortlessly. It does take more persuasion than some others in the group to release, turning it off the wind and shifting weight back on the board to drive the power into it. Accelerating progressively, it is easy to find the straps, the ride comfortable and forgiving whilst encouraging the rider into an upright stance over the board. As the wind increased and we loaded the board with an efficient sail, we did find the fin begin to falter, spinning out more often than expected, particularly when pointing high to the wind. Changing the fin to a different model did alleviate the issue, but didn’t completely annul it, leading us to believe the Firemove is more suited to comfortable freeride cruising rather than high end blasting. It certainly feels its size, providing a safe and dependable platform for the progressing rider. In the gybe, the 140 cuts a smooth and predictable path through the water, the wide tail requiring a positive step over, whilst the volume offers the support to mask over any clumsy footwork. 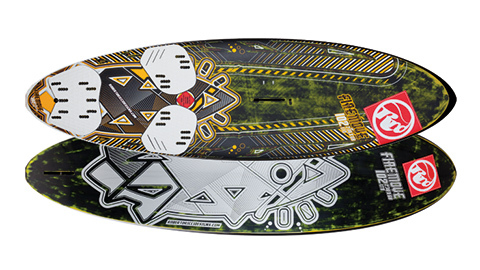 Stamp or drive hard and the board responds, carrying its speed as it glides freely through the turn. It really does flatter the rider, rewarding positive input with secure crisp cornering, and the volume to support any mistiming. The Firemove 140 is a large stable platform, best suited for easy cruising over large distances before responding to positive carving styles with smooth glide and hassle free exits.